Gerhard holds a university degree M.A. in contemporary German Literature and Political Science. He is working as an entrepreneur since 1983, started IT-Trainings in 1986 and founded G&K HorseDream GmbH in 1996 together with his wife, Karin. They both started with horse assisted leadership seminars and team training on the market in 1998 with horses as medium and catalyst. That is his story: „Karin and I had been self-employed since 1983 in the IT-world, working around the clock. In 1989 we decided to go on a riding holiday. I was nearly 40 years old when I climbed a horse for the first time, and since then, I have not looked back. We bought our first horse three months later and then the second one. 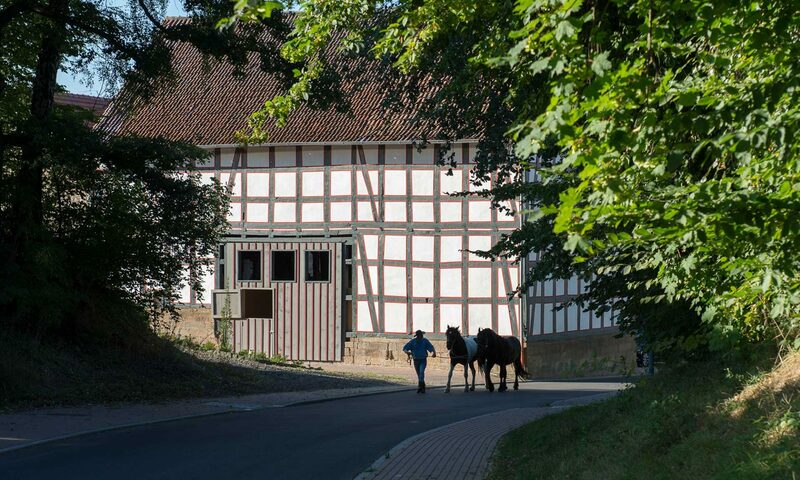 We went through the so-called traditional German riding education for one year and eventually left this scene because of the treatment of the horses. We continued learning on our own for the next two years. The priorities in our daily life had completely changed. Our IT-business- customers were interested in what we did with the horses, too, and instead of inviting them for dinner, we invited them to the horses. At the end of 1995, one of our employees suffered from stress hormones and wanted to leave the company. We offered her a six months sabbatical but asked her to come with us to the horses once a week. She agreed, worked with us once a week, without a concrete concept, and three months later she felt fine again to get back into IT-business. This experience was the reason to develop a horse assisted program for corporates. We started with test seminars with our business friends and their families and went to the open market at the beginning of 1998. From the very first beginning, we did nearly everything on our own – with the help of lots of books and with the help of the horses. The name of our educational product HorseDream stands for two facets of leadership, management, and personal development: The Horse is a very present being, very real, always living in the here and now. That makes people, working with horses in Horse Assisted Seminars, learn about 100 % presence, responsibility, self-confidence, awareness, and all that is necessary to develop leadership skills. But the Horse, with its historical and mystical background, is also a Dream. It opens horizons, changes belief systems, empowers people to step out of the box. So HorseDream means exactly what is needed in modern business life: reality and vision – both concepts are incorporated in this name. Today we and our partners live this dream: to establish Horse Assisted Education as a normal way of further education in companies, organizations and for personal purposes. In August 2004 Gerhard Krebs founded the European Association for Horse Assisted Education (EAHAE). The organisation is led as a HorseDream Business Unit. The vision is to establish and develop HAE as a general form of personal and professional development in – not only European – enterprises, organisations, institutions, societies, and for personal purpose. Therefore EAHAE collected all sorts of trainers and people who were interested in HAE without looking for any quality standard. The tasks just were to connect all, to publish the activities on the internet platform, and to organize a yearly conference. Everybody who was providing HAE in Europe could become a full member. Associated member could become, who was providing HAE outside Europe or who was not yet providing Horse Assisted Education but wanted to cooperate with a full member or to support the work of the association. The yearly membership fee included for both kinds of members: a personal profile on the EAHAE website, linked to the own website, the right to use the EAHAE database with press articles, videos, radio and TV performances, to use internal EAHAE documents, information, and presentations, to apply to attend the annual conference and EAHAE seminars and trainings, and to participate in the EAHAE website award. With the 4th Annual Conference which was held 14 – 16 November 2008 at Sielanka Farm, near Warsaw, Poland, development of the organisation was brought to a new level. Stepping into the next period meant to focus on quality. Since 2009 a new member can only become, who first attended an EAHAE authorized Train The Trainer seminar. Before having attended this seminar, new members are associated as „Friends“. I want to take you with me on the trip to the beautiful Medicine Horse Ranch in Tomales where we ran a 2-day EAHAE International Train the Trainer seminar and a 6-day HorseDream Partner License Workshop. Enjoy some minutes with horses and statements and some more with music on the road.